Matrox Monarch HDX is a compact, easy-to-use, dual-channel H.264 encoding appliance for broadcast streaming and recording featuring 3G-SDI and HDMI inputs with frame synchronization. Matrox Monarch HDX is a compact, easy-to-use, dual-channel H.264 encoding appliance. Designed for complete workflow flexibility, Monarch HDX features 3G-SDI and HDMI inputs with frame synchronization to compensate for unstable sources. Two independent H.264 encoders provide redundancy or can be set to stream and/or record at individual settings. From any SDI or HDMI input source such as a camera or switcher, Matrox Monarch HDX generates two H.264-encoded video streams at bitrates from 200 Kbps to 30 Mbps. Monarch HDX is packed with features that make it ideal for broadcasters, event producers, medical facilities, CDNs, educational institutions, houses of worship, corporate communicators and legal videographers. HDMI Video Output: Preview output of video input signal. Preview output is available when source is SDI or HDMI. Note that when input is an SD SDI resolution, the HDMI preview output will show video windowboxed on an HD output. SDI Video Output: 0 frame latency passthrough of Input signal. Output is a clean distribution of SDI incoming signal. Hardware bypass relay present in SDI signal path is "closed" on power failure. Frame Synchronization: The Monarch HDX contains frame synchronization circuitry designed to compensate for disruptions of the input signal. This circuitry is in place for both SDI and HDMI inputs. Streaming and recording operations will proceed cleanly with repeated or dropped frames. Encode frame rates selection includes; 60/50, 30/25/24 and 15/12.5. Recording Lengths: Maximum file length of 300 minutes—irrespective of storage type used. File splitting feature allows a user to record continuously for long periods by defining file segment sizes. The Monarch HDX will create these sequential file segments over the course of the recording operation without losing a single frame of video. File segment can have a length of 1 to 300 minutes. Computer Based control: HTTP via standard PC or Mac web browser using Monarch HDX Command Center. 1 x SD card Slot: Supports SD and SDHC cards. Only NTFS formatted SDXC cards are supported. (Class 10 highly recommended). Network Mapped Drive: Support for writing to shared folders in computers found on a network using Windows Share protocols (suitable for Windows system) as well as NFS protocols (suitable for Mac and Linux systems). Start Stop Controls: These buttons are available at all times no matter where you navigate in the UI. Status Page: Provides relevant operational information concerning Status of Monarch HDX unit at that time including; Input video detection and resolution, State and configuration of Streaming operation, State and configuration of Recording operation, Error conditions, etc. Control Page: Multiple Monarch devices can be connected in a Master/Slave topology to allow for synchronized recording and streaming operations across multiple units via a single interface. Record Settings: Configuration of recording parameters set within this page. A number of presets are included which are selected based on post event use of the recorded asset. If file is to be uploaded for VOD purposes, a YouTube preset may be selected. If content is to be edited for high quality production, a higher bitrate preset may be preferable. Streaming Settings: Configuration of Streaming parameters performed on this page. The RTMP or RTSP credentials as well as encoding parameters are entered. Encoder presets have been included to quickly select an ideal encoder settings based on desired delivery resolution or bitrate. The loading of Flash Media Server XML configuration files is supported. Administrative tools: Device Naming, IP configuration, Date/Time settings and a variety of other tasks performed via this page. 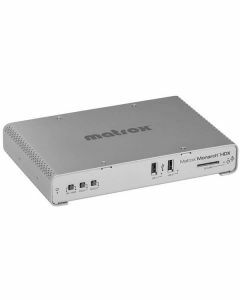 Additional Tools: Matrox provides PC or Mac based utilities to help detect the Monarch HDX Device on a particular Network (DHCP server required), to update Monarch HDX devices with latest firmware and to reboot the devcies remotely.